WHERE IS THE WITNESS? - Antony Raj J.
WIKILEAKS AND WICKED LEAKS - J. N. Manokaran exhorts: Freedom has to be tempered with responsibility. 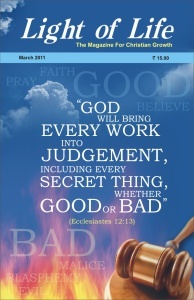 PURPOSEFUL LIFE - We should live in accordance with God's counsel, asserts P. Selvaraj. JUSTICE OR REVENGE? - Shantanu Dutta exhorts us to put things in God's hands. CORRECTLY ADDRESSING PRAYERS - Donald Godfred points out some anomalies in our prayer. THE IMPORTANCE OF THE CHURCH - Primary function of the church is to give light, emphasises Zac Poonen. BIBLICAL RESPONSE TO HIV/AIDS - A call to reach this community by R. T. Raj Kumar. NOTES ALONG THE JOURNEY - XXV - Oby Cherian exhorts: "Your commandments make me wiser than my enemies."